Native windflowers bloom near the ground in Westborough’s woods in late April. This anemone comes up in patches of sunlight before the trees leaf out and disappears by mid-summer. Now that the season for flowers is finally arriving, one of the pleasures of walking in Westborough’s woods is finding the brave early blossoms of spring, such as the windflowers of late April. Cast your eyes over the ground to spot our native windflowers (Anemone quinquefolia), also called wood anemones. They thrive in the sunlight that reaches the forest floor at this special time of year before the trees leaf out. Only a few inches tall, these lovely white flowers, sometimes faintly tinged with red, often grow in patches at the base of hardwood trees. Their dark green leaves typically have 5 deeply cut leaflets. By mid-summer, these leaves die back. On a breezy day you’re likely to see a reason for the name “windflower” as the 1-inch blossoms toss in the wind on thin, flexible stems. The name may also simply come from the windy season when they appear. The name “anemone” also comes from the Greek word for wind and is applied to many other related plants, including a very similar European windflower or wood anemone (Anemone nemorosa). As welcome as spring is in New England, it creates a variable and stressful environment for plants when it first arrives. Early spring plants have special ways of dealing with it. Where do windflowers get the energy to come up and bloom so early in the season? As perennials, they live for several years, and they store energy in their roots and underground stems. By using this energy for a big push to come up early, they take advantage of the sunlight that will soon be shut out once the trees grow their leaves. You might notice that a faint red blush develops on the white windflowers. It serves as a kind of sunscreen, protecting the flower from the sunlight that grows stronger each day in spring. The blush is due to a pigment like those that create the reds (but not the oranges) in fall leaves. This pigment protects the flower by absorbing blue-green and ultraviolet (UV) light. Sometimes the plant’s young leaves are also reddish. Windflowers are easiest to spot in the middle of a sunny day, when the flowers are open. The flowers last for several days, but like other anemones, they close at night and on cloudy days. In this way they keep their pollen dry at times when dew and rain might leave it clumped and soggy. How do the flowers open and close? After all, they have no muscles and nerves to help them move. The opening and closing of windflowers most likely comes about as water moves into and out of the flowers. When water moves into a flower, it stiffens and opens. When water moves out, the flower softens and closes, almost as if it’s wilting. Water moves into the flowers in sap, brought along with the sugars that the plant starts making when the sun shines. On a larger scale, the plant’s particular genes turn on and off in response to varying conditions in the environment, controlling the biochemical processes in the plant, such as the manufacture of sugars, and making things happen or not happen. Reproduction is a challenge for early spring plants. It’s hard to count on insects as pollinators so early in the season, and weather can be a problem. But windflowers have a few different options. They don’t make nectar, bright colors, or much scent to attract insects, but early bees and flies come to the flowers to collect pollen. And spring breezes blow pollen from one flower to another in a patch. The flowers also fertilize themselves. And in any case, the plants can spread via underground stems. Like some other spring wildflowers, including some violets, windflowers make use of ants to move and plant their seeds. Not only do the seeds drop on the ground, but they also attract ants. 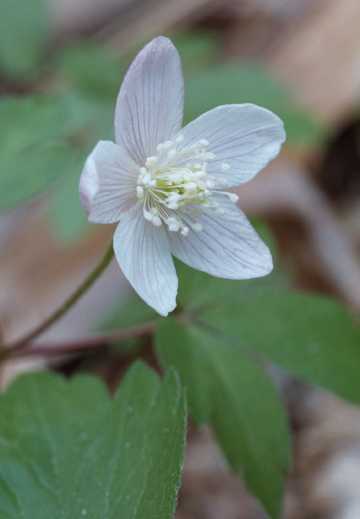 Windflower seeds have bumps with oils and sugars that ants find tasty, so ants take the seeds back to their underground nests, sometimes traveling 75 yards with them. There they feast on the bumps and put the seeds, unharmed, in unused tunnels, which happen to be good places for the seeds to sprout. Native Americans had medicinal uses for windflowers, and colonists used them as they had used anemones in Europe. Windflowers are in the buttercup family (Ranunculaceae) and have an acrid sap, as do many other members of that family. Windflowers were used externally to treat gout and rheumatism, and they may even have been used to remove corns from the feet. Gardeners who are interested in native plants might consider using windflowers as early spring plantings. The acrid sap may discourage rabbits from nibbling the plants. As always, plants should not be collected from the wild. Instead, grow them from seed or buy them from a reputable nursery that does not collect plants from the wild. Windflowers look somewhat like another plant, rue anemone (Thalictrum thalictroides), which seems less common in our woods. Rue anemone has several white flowers on a stem, instead of one, and its leaves are smaller and rounder. It, too, may be a possibility for a wildflower garden. Looking back to last fall, we clearly had an opportunity to see a bird that we don’t always get to see in Westborough. Red-breasted nuthatches (Sitta canadensis) appeared last November and December at feeders at six different addresses around town, on Isaac Miller Road, Haskell Street, King’s Grant Road, Partridge Road, and two Ruggles Street locations. Red-breasted nuthatches usually don’t migrate. They typically stay year-round in the northern woods, feeding in winter on seeds in cones of spruce and fir trees. But every few years, the trees there produce a meager seed crop, and red-breasted nuthatches apparently notice during mid-summer and start moving south in search of better food supplies for the winter. When will we see red-breasted nuthatches again? Probably in another couple of years, but you never know.